Is it Legal to Pass on the Right? In this article, we will give you specific Nevada rules to help you understand exactly when it is legal to pass on the right. If you know the applicable rules, you can save yourself the headache of getting a traffic ticket or it could help you determine if someone else was liable for damage that they caused to you and your vehicle by passing on the right. 1) The vehicle you want to pass is in the process of making a left hand turn or is signaling to make a left hand turn. 2) The road is designed and marked for two or more lanes of traffic in the same direction and you are passing on the right in a designated lane. 3) The road is a one way street and there are two or more lanes designated for vehicle traffic. If none of these three exceptions apply to your situation, then the act of passing on the right was done illegally. If you were injured in a traffic collision because someone was passing on the right, you may have a claim against the person who was making the maneuver if they did it illegally. The violation of a state statute is strong ground for establishing negligence. Once negligence is established, you would just need to demonstrate the extent of your injuries in order to get compensated for the other person’s poor driving. However, if you were involved in the traffic collision and they were passing in a legal passing lane or were going around you when you were making a left hand turn, it is possible that you will not succeed in your case. If you were injured and you think the other driver was at fault because of an illegal traffic maneuver, you should speak with a Las Vegas personal injury attorney who can analyze your case. After an analysis, your attorney should be able to tell you whether or not you have a good case against the other driver. If you have been injured in a Las Vegas automobile accident because someone was illegally passing on the right, you should speak with a Las Vegas personal injury attorney to understand your rights. 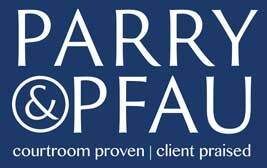 The experienced attorneys at Parry & Pfau are prepared to assist you with your needs. We would be happy to offer you a free consultation with one of our expert personal injury attorneys. Just call 702-912-4451 or click here to request a meeting time. We look forward to speaking with you.